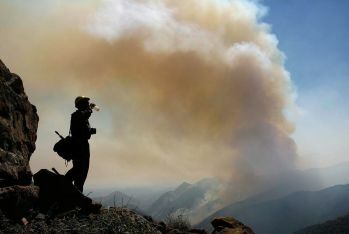 Smoke from wildfires can directly impact both the public and wildfire personnel. A new Technical Specialist is being made available to incident management teams and agency administrators to help address this issue. Air Resource Advisors (THSP-ARA) are trained to be dispatched to an incident to assist with understanding and predicting smoke impacts on the public and fire personnel. Air Resource Advisors analyze and summarize air quality information. They work on Incident Management Teams with public information officers, fire behavior analysts, meteorologists and others addressing smoke issues. They coordinate with multiple agencies to address public health risks and concerns, risks to transportation safety, and fire personnel exposure including in base camp. Wildland Fire Air Quality Response Program webpage: The primary information source addressing air resource advisors and the wildland fire air quality response program. ARA Deployment Calendar: See a calendar of current ARA deployments. Wildland Fire Air Quality Response Program: This 30 minute presentation describes the Wildland Fire Air Quality Response Program and examples of its use. Presented by Pete Lahm, USFS Fire and Aviation Management. (MP4 file for viewing in Firefox)(WMV file for viewing in IE). National Wildfire Coordinating Group's ARA Description: A functional description of Air Resource Advisors.